Successful oil extraction begins with clean commodity. foreign matter (FM) causes less oil extraction and premature wear of the oil press parts. The commodity cleaner seperates leaves, dust, husks, halls, chaff, twigs, rocks, tracker parts and other foreign matter from your commodity. STEP 2: Separation:The commodity flows through a large scalping screen collecting forieng material larger than the commodity. Next the commodity flows onto a smaller sieve screen where forieng material smaller than the commodity flows through the screen to a tray below. STEP 3: Collection: The commodity flows out of the bottom of the cleaner into the hopper. The hopper contains four ports to feed up to four oil presses. The commodity could also be hooked up to an auger system using one of the two side ports. 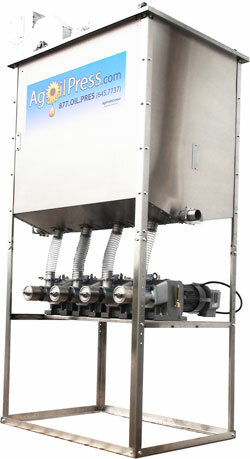 The OilPress.Co Commodity Cleaner is a simple concept done right. The entire Commodity Cleaner is made out of stainless steel that will last many generations. Our commodity cleaner is made to work with any commodity. Because of its simplicity, all we need to change is the size of the scalping screen and the sieve screen. When you purchase the commodity cleaner, let your sales rep know what commodity you are crushing, and they will size the screens accordingly. Shipping to all 48 states is $500.